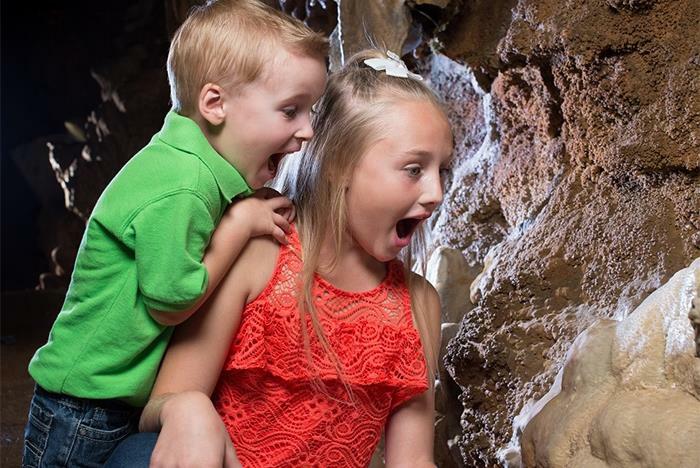 An exciting family adventure open year-round in Branson West, Missouri, Talking Rocks Cavern is ideal for adventurers who long to explore. 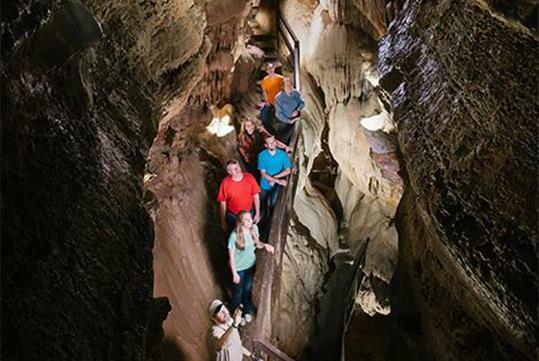 This unique natural wonder is a comfortable 63 degrees all year long and features educational tours of a spectacular vertical cave, two SpeleoBox crawl mazes, nature trails, a lookout tower, picnic areas, gemstone mining, and more. 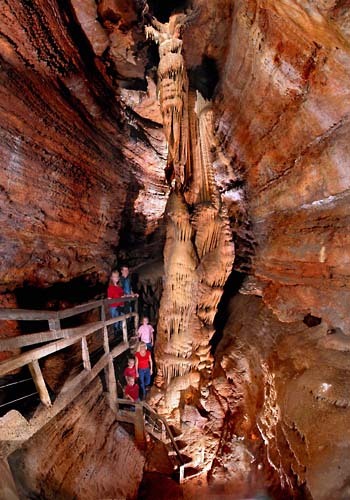 View the beauty of Missouri--underground! 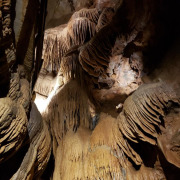 Guided cave tour features numerous geological formations. Nature trails and lookout tower on-site. Wear slip resistant shoes as there are areas a bit slippery. Sandals and Flip Flops are not recommended. The guided tour is an hour long. The temperature is a cool 62 degrees. Missouri is the cave state. 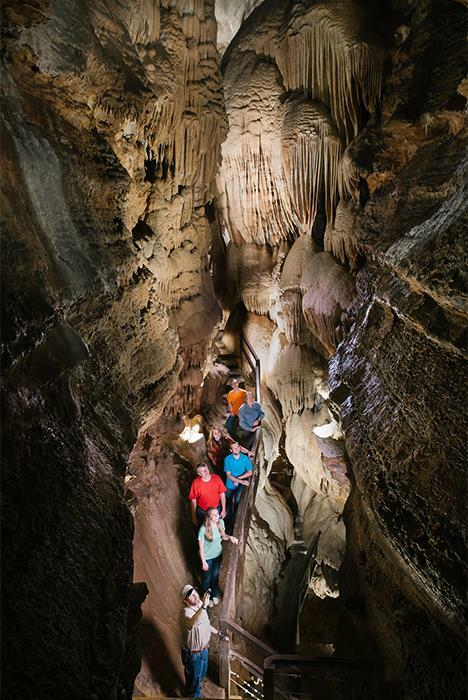 Talking Rocks Cavern is open year round. 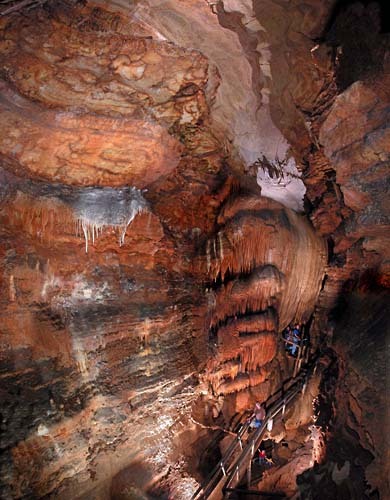 Talking Rocks Cavern is vertical in nature, and has concrete handrails and steps throughout the cave. 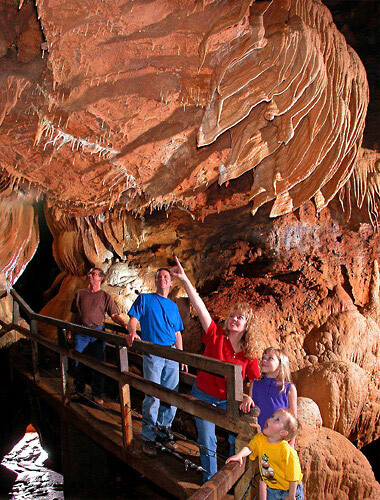 People of all ages go into our cave on a regular basis where they can enjoy the comfortable 63-degree cave air. 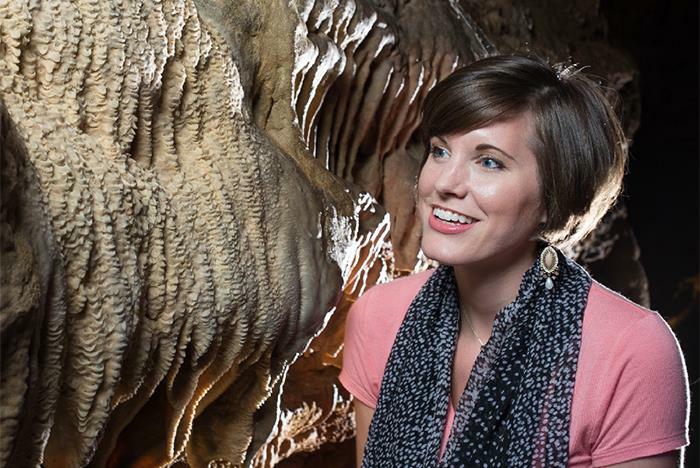 The hour-long tour of Talking Rocks Cavern is what we call "edutainment." This means that the cave guides focus on education, as well as entertainment. 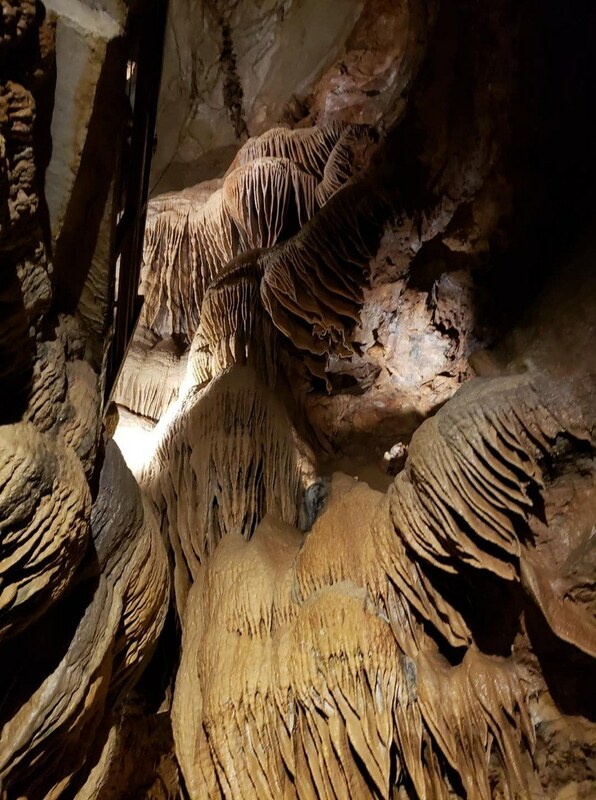 You will learn about the caves discovery and related history, as well as learn about the mineral deposits and other geological information. Our cave guides are ready to answer your questions and can find answers to those questions they may not already know. 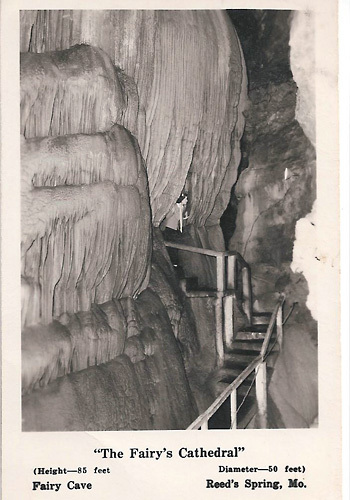 Talking Rocks Cavern was first named "Fairy Cave" by the early cave developer Turman Powell after he first explored the cave. His comment was that it looked like "a subterranean fairyland". 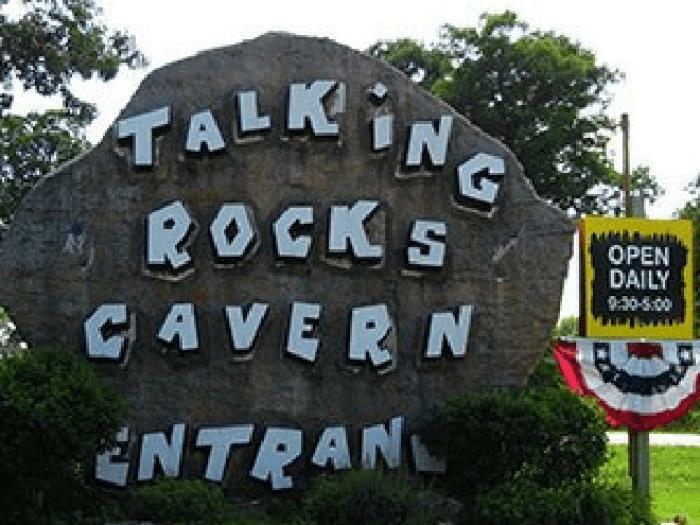 The caves name was changed to Talking Rocks Cavern in 1969 when Silver Dollar City purchased the cave. They chose to change the name based on a quote from Waldo Powell, son of Turman Powell. Waldo would spend a lot of time looking at the rocks and mineral deposits in the cave, and noted that the physical evidence in the cave would tell him a story about how it formed. 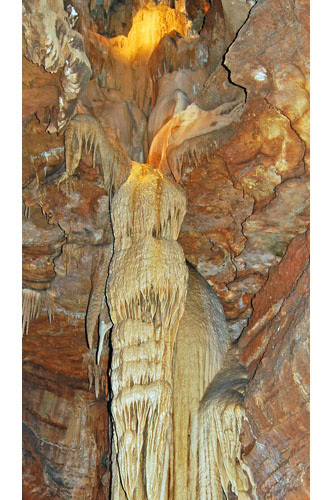 Thus, it was an inspiration for the new name "Talking Rocks Cavern." 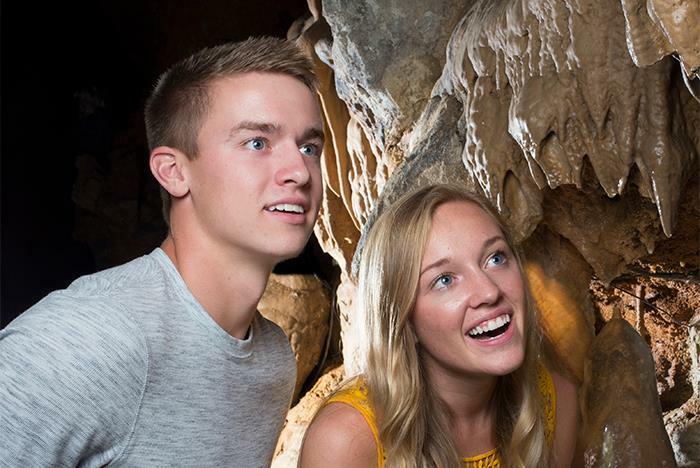 After your cave tour, check out our 4,000 square foot Rock & Gift Shop. 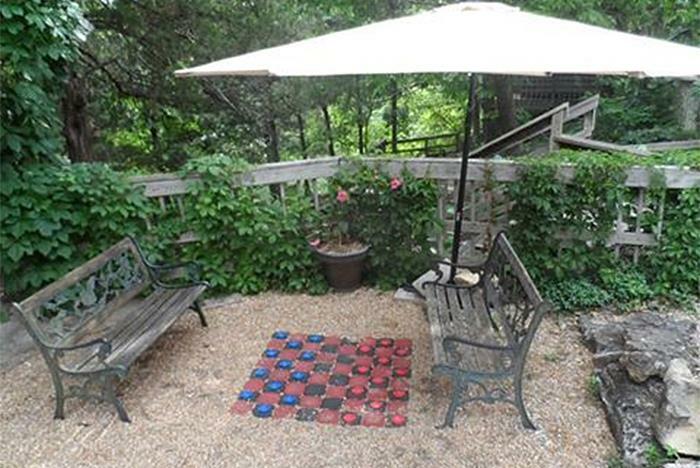 Other above-ground activities include Cave Country Miniature Golf and gemstone panning. 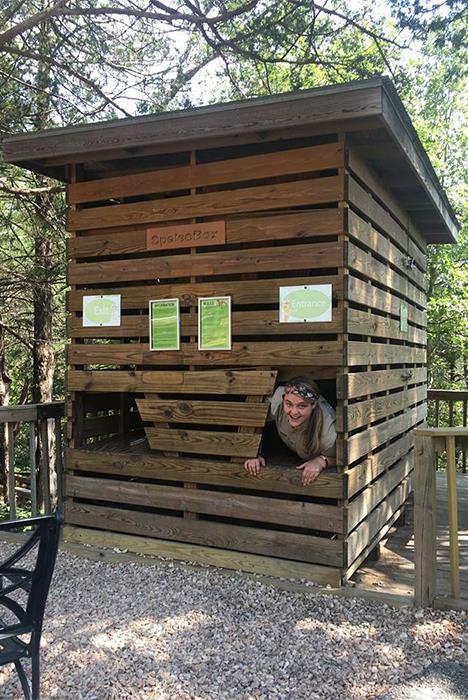 The nature trail, lookout tower, shaded picnic areas, new Kid's Play Area, large outdoor checkerboard and two SpeleoBox crawl mazes are FREE for our guests! Tickets are valid any day of travel. One hour guided tours depart frequently all day. How often do tours depart? They depart about every hour. Each guided tour is an hour long. What is the temperature in the cavern? It is a comfortable 62 degrees of cave air. What is included in my admission ticket? 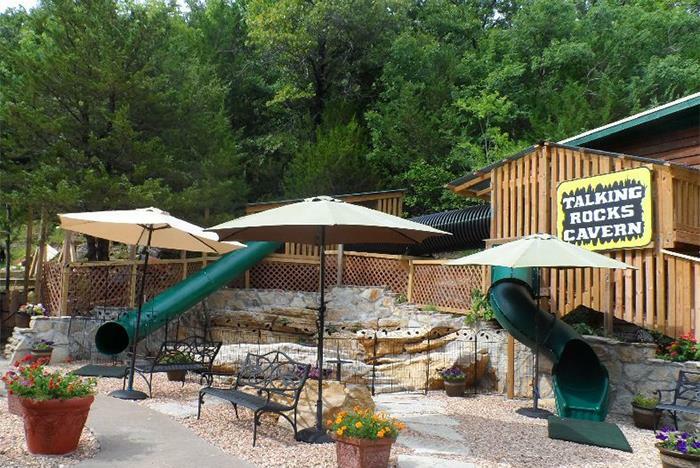 It includes a guided admission into the cavern, SpeleoBox Maze, the Nature trail and lookout tower. How long are the nature trails? 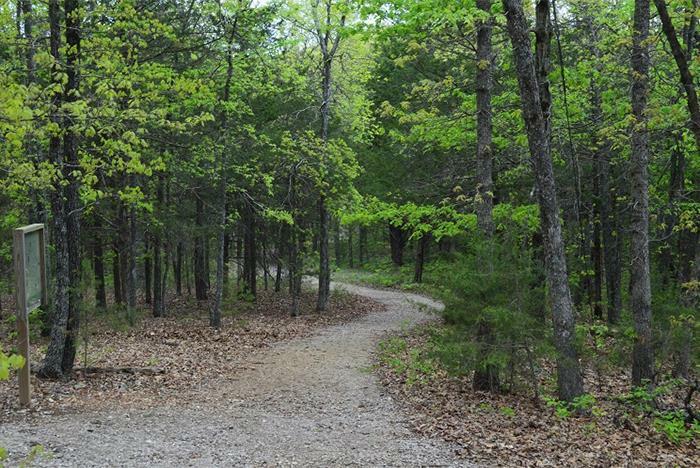 The Springhouse Trail” is .2 miles in length and takes approximately 10-15 minutes to complete. The Stone Pancakes” is .4 miles in length and takes approximately 20-25 minutes to complete. The “Lookout Tower” trail is another of the moderately difficult trails. It is .5 miles in length and takes about 30 minutes to complete. Your destination on this trail will take you to the 40 foot Lookout Tower. Be sure and climb to the top for a one of a kind view before you head back to the cave. The most difficult of the 4 trails is known as “The Waterfalls”. This trail is .8 miles long and takes 45 minutes to complete. Although this is the longest of our 4 trails it provides you with a visit to Lookout Tower and then down by the waterfalls. You have a choice of 3 sizes of gem bags: Small bag-$5.99; Large bag-$8.99 and Emerald bag-$10.99. Should you choose the small or large bag you are guaranteed to find any one of a variety of semi-precious gems. If your choice is the Emerald Bag then your treasure will definitely include a piece of emerald. Upon purchase of your gem bag you will be given a Gem Identification Card to help you identify the type of gemstone you discover. Now you will proceed out to the sluicing troughs. Empty some of your mining rough into a screened sluice box, dip the box in the water and mine those gems! Remember sluicing is fun no matter what age you are. Is the Mini Golf included in my admission ticket? No, this costs extra. The Mini Golf tickets can only be purchased at the Cavern.